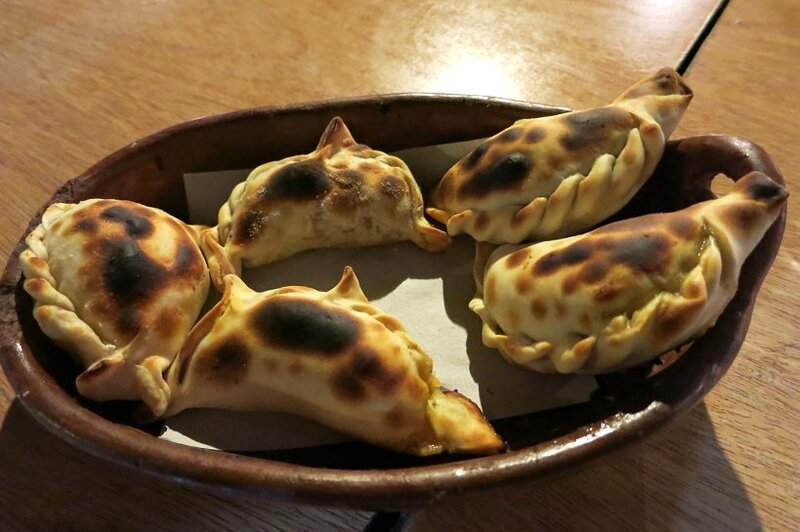 Talking about Authentic Food in Argentina would not be complete without talking about its Authentic Empanadas. 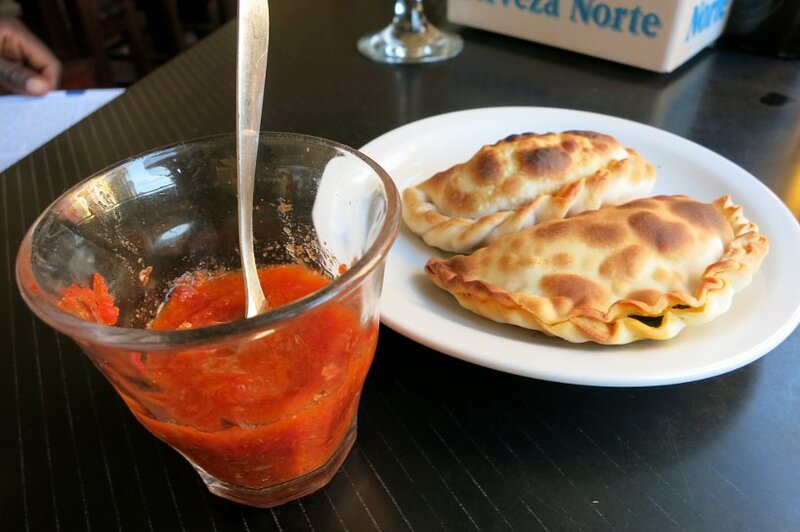 Although we have presented many different Argentinian specialties including Parilla, Choripan, Milanesa, Helados, Alfajor, Locro, Humita, Llama meat, and more, we have mentioned Empanadas occasionally without making a case for it. Now that we have been in Argentina for two months, it’s time to reveal our quest for the best authentic empanadas in Argentina. The most common is “carne” or meat generally mixed with some onions, vegetables, and in some cases eggs or potatoes. There are different types of empanadas and the ones from Buenos Aires are not exactly the same as the ones in the rest of the country. In fact, each province has its own special touch. In Buenos Aires, we discovered a small, non-fancy empanada joint in the Monserrat barrio called Quiero Empanada which sells empanadas on the go. Here we tried carne picante (spicy beef) and enjoyed the delicious sharp bite. 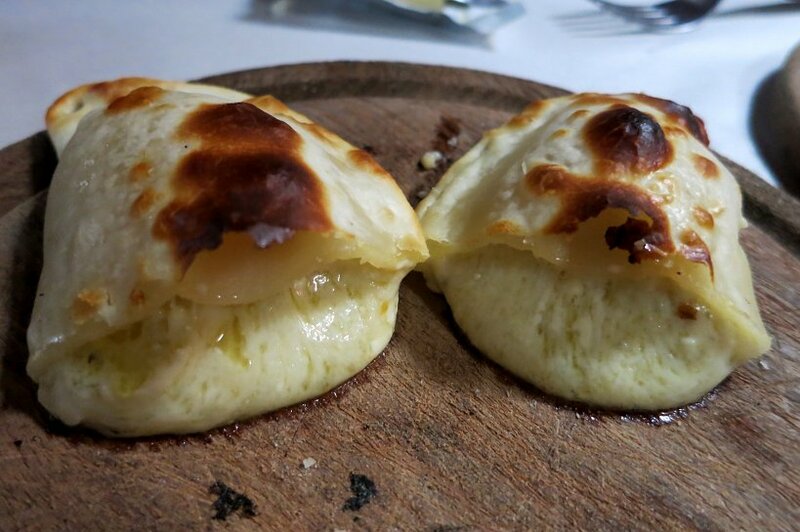 Others that we really enjoyed very much are the ones from Cumaná restaurant in Recoleta. In addition to their specialties like lomo picante (spicy, chopped tenderloin), jamon y queso (ham and cheese) and others, our absolute favorite was their Roquefort empanada. I don’t know if it is due to our love for cheese but they are so good, melting in the mouth with the strong flavor from the roquefort cheese which is slightly softened by the fact that the empanadas are warm. Simply delicious! The nice thing about empanadas is that you can eat them at any time. They are great as an appetizer to start off a meal. They can also be eaten as a full meal by the dozen (usually cheaper) for lunch or dinner or you can buy just a few of them at a panaderia (bakery) as a snack. 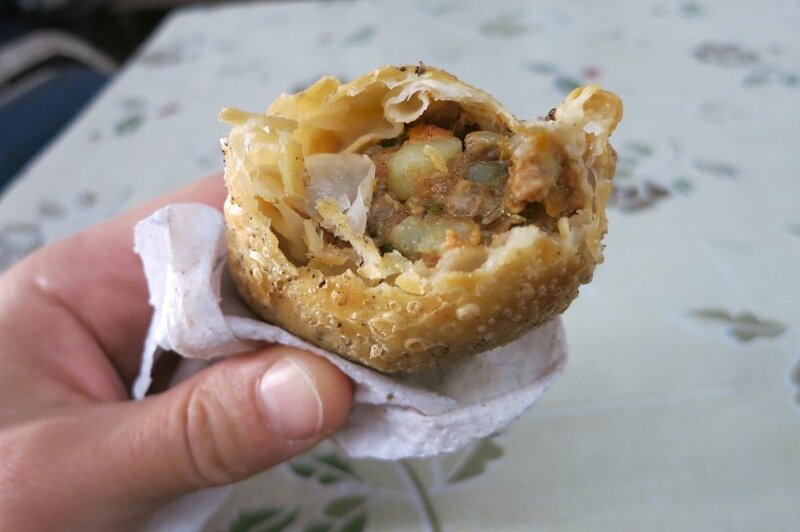 When it comes to finding the best authentic empanadas, almost all of the porteños (locals from Buenos Aires) advised us to try out the ones in Salta and Tucuman and then make up our minds. First, we traveled to Salta and on the way stopped in Mendoza to experience the Malbec wines. Here we learned how to make Mendocini empanadas and also tried Empanada with the local specialty which are filled with choclo (corn and milk preparation). Too mushy and not quite our favorite but nice to experience. 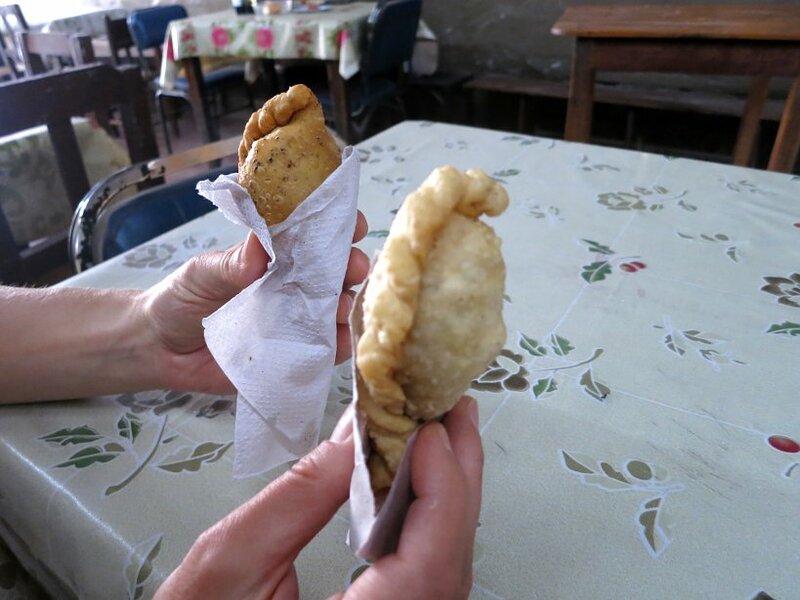 When we made it to Salta, we find out that the empanadas Salteñas are much smaller than the one in Buenos Aires, making it less of an excuse to buy them by the dozen. 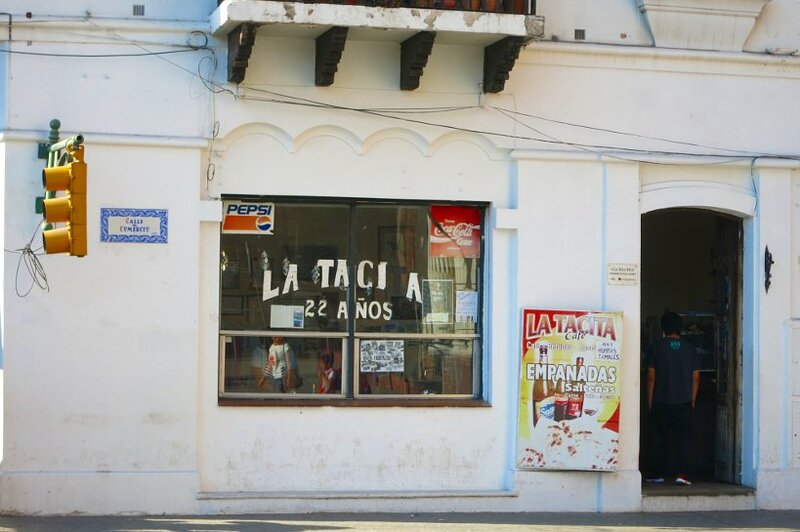 That’s what happen to us at La Tacita, arguably the best authentic empanadas joint in Salta. We started by ordering 2 empanadas, then added 4 more and then 2 more. By the time we left we had eaten 8 of them. When we came back the next day, we decided to order a dozen! These are some of the best authentic empanadas we’ve had. They are a bit tiny therefore easy to hold in your hand and small enough to eat them in two bites. They were really tasty and the carne (beef) were our favorite. They are well prepared with green onion, and potatoes, a delight! Please note that they take a while to serve them because they cook them in their clay oven per order. They are really hot when they come out, so let them cool down and enjoy them with a red salsa sauce that accompanies them. Amazing. Un régal! Another place we enjoyed was El Patio De La Empanada in Salta. We had talked about this restaurant in our previous post where we tried Tamales and Humita which are other local specialities from Salta. 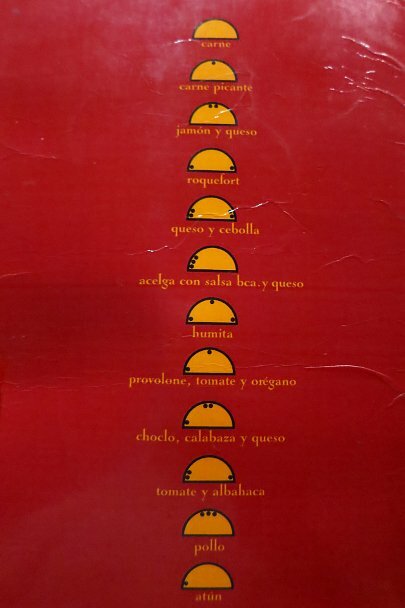 El Patio De La Empanada offers over 14 different types of empanadas. We tried a few different types and particularly enjoyed the empanadas Arabes. 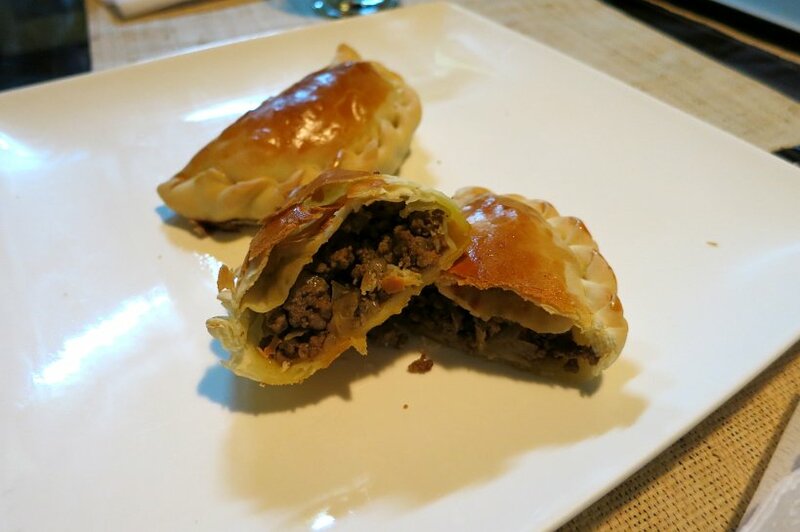 These empanadas have a unique triangular shape and the beef is cooked with lemon, onions, red peppers, tomatoes, olives with salt and pepper. Absolutely delicious with a Middle East flavor. We highly recommend these empanadas as well as the location. Be sure to check it out when you are next in Salta. As we continued our journey to the north of Argentina, we ended up in Tilcara a little town in the province of Jujuy. Here we tried Llama meat as well as Llama empanadas at La Pena de Carlitos. The Llama meat by itself was delicious. 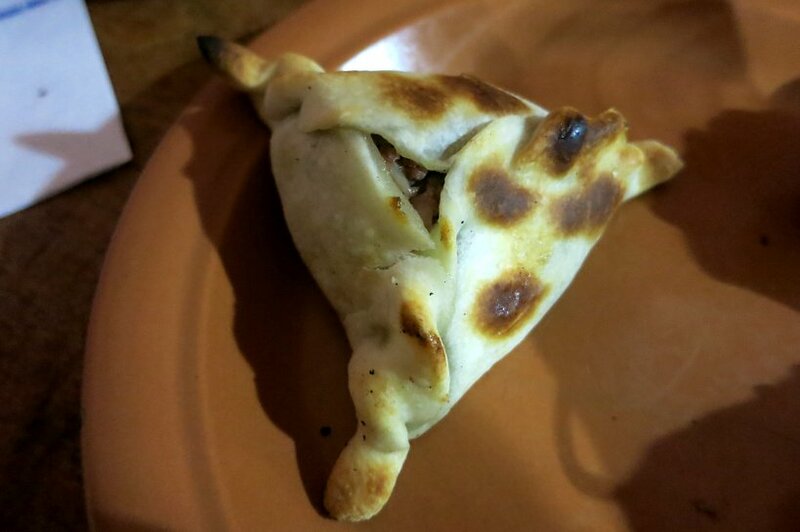 However, for the empanadas, we could not tell much of a difference between the carne (beef) and llama meat. They were interesting to experience, but not particularly distinctive. 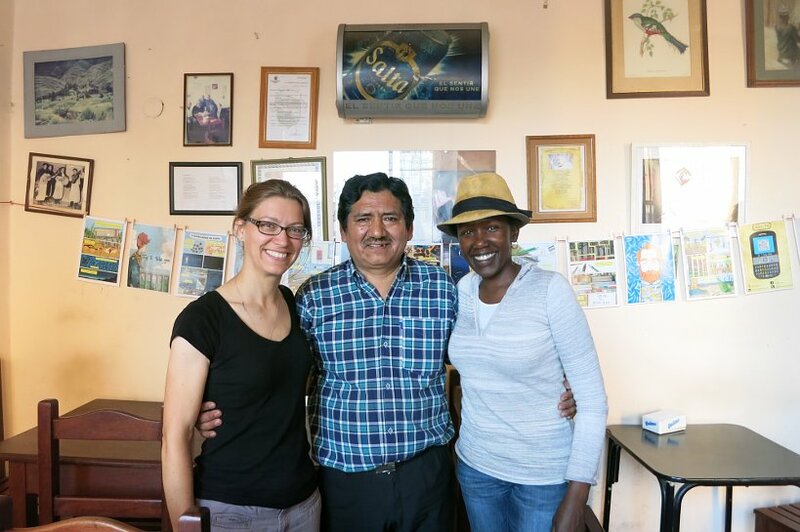 We tried Quinoa empanadas which are a local speciality in Tilcara and were pleasantly surprised. Keep in mind Quinoa comes from this region and there are a variety of different types of Quinoa. We found the Quinoa empanadas crunchy and with a subtle, hearty flavor. Delicious and absolutely worth trying out. On one of our trips to the Tilcara Mercado Municipal (farmers market) we stopped by and decided to have lunch at the market. As we were waiting for our lunch, we started off by trying for the first time fried empanadas. We opted for carne (beef) and were surprised by their crunchy taste. However, we found them too fatty. They were not as tasty as the fried empanadas we savored in Ilocos Norte in the Philippines. Bottom line, fried empanadas in Argentina do not compare to the delicious baked ones. Argentinian desserts are prominent in Argentina food culture. We had heard about sweet empanadas but had not had the chance to try them. 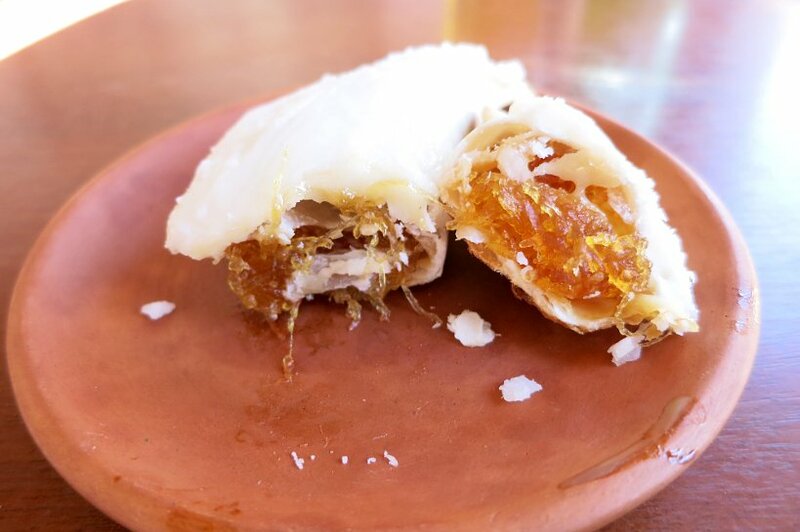 So, en route for Cafayate, we stopped in Purmamarca and had the opportunity to try the sugary empanadas. They are easy to tell apart because of their white sugar coating. The one we tried was filled with dulce de cayote (sweet squash) mentioned in our previous post. It was very interesting but way too sweet. We ended up scraping off the sugary coating but did not enjoy them. We will definitely stick with the salty ones. On our way back to Buenos Aires, we made a stop in Tucuman and our main reason for stopping in Tucuman was to try the famous empanadas. 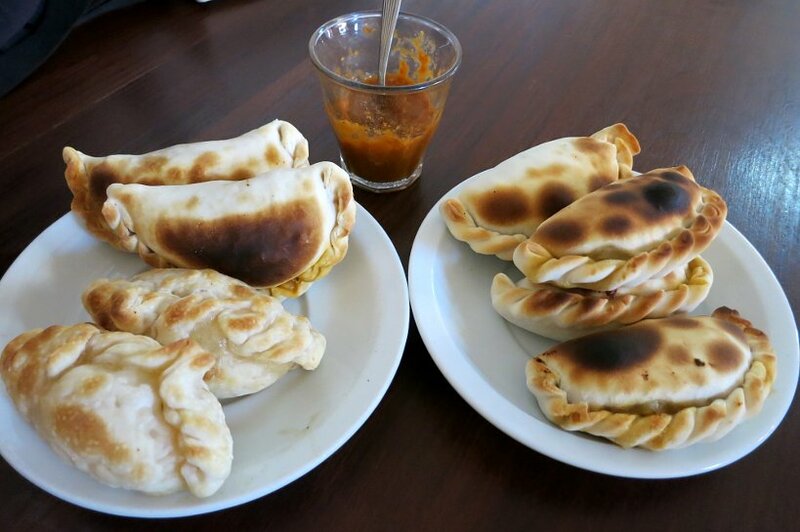 We had heard people say that the best authentic empanadas come from Tucuman. Indeed, it is in this province where they have events dedicated to the Empanadas. They have a touristic Ruta De La Empanada (an empanada circuit) with participation from over 50 restaurants in the surrounding area. 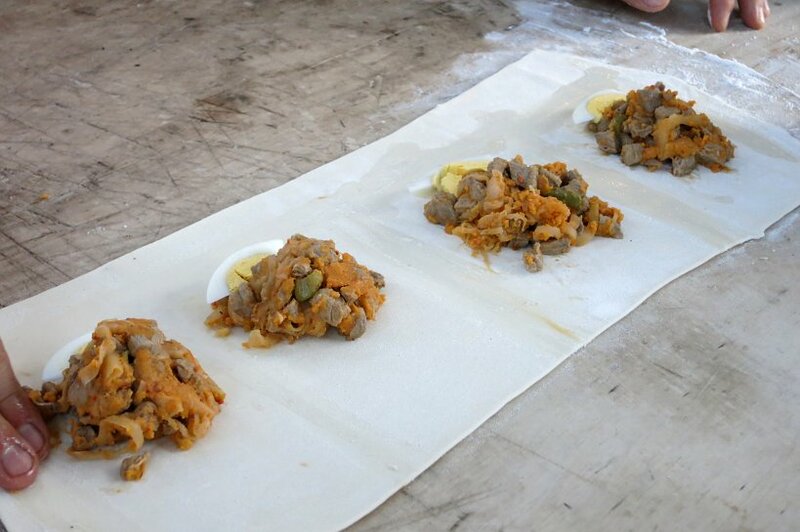 Tucuman also hosts the National Festival of Empanadas in September. Given this hype, we were excited at trying these empanadas. The empanadas in Tucuman and Salta are indeed different. 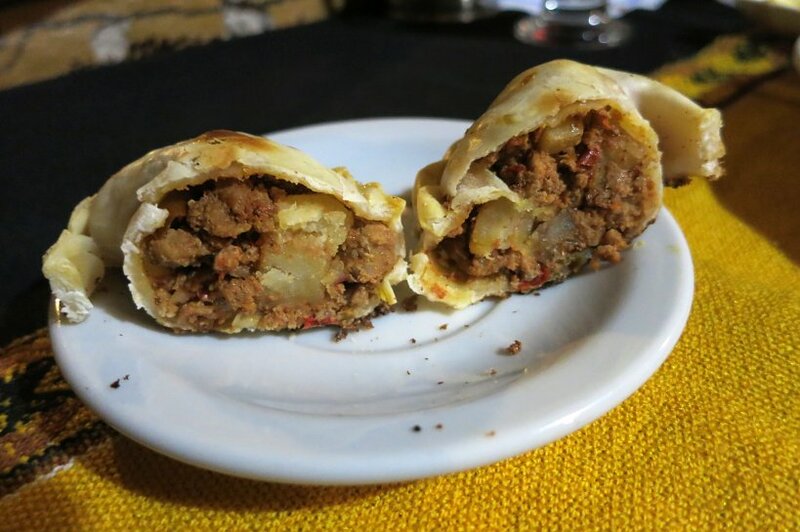 In Salta the empanadas usually have potatoes and hard boiled eggs, green onion and red pepper. They are also are accompanied with a spicy picante sauce. 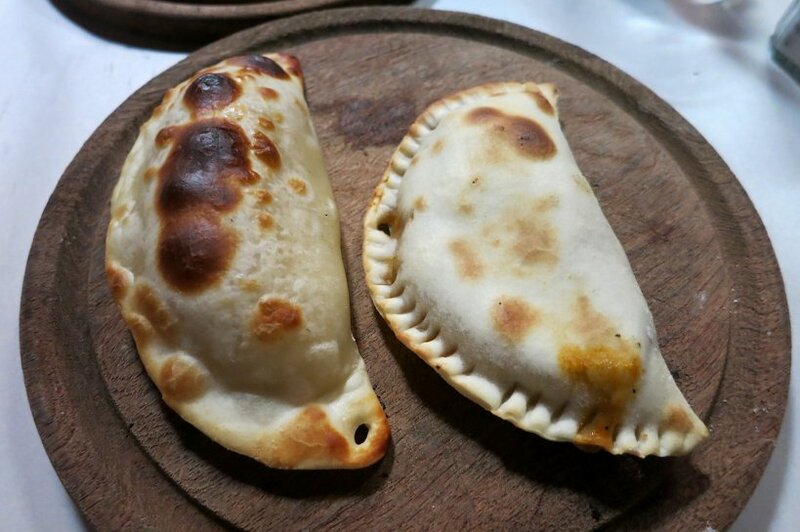 In Tucuman, the empanadas do not have potatoes and the meat is chopped and cooked with green onions, cumin, red and white pepper, paprika and garlic. 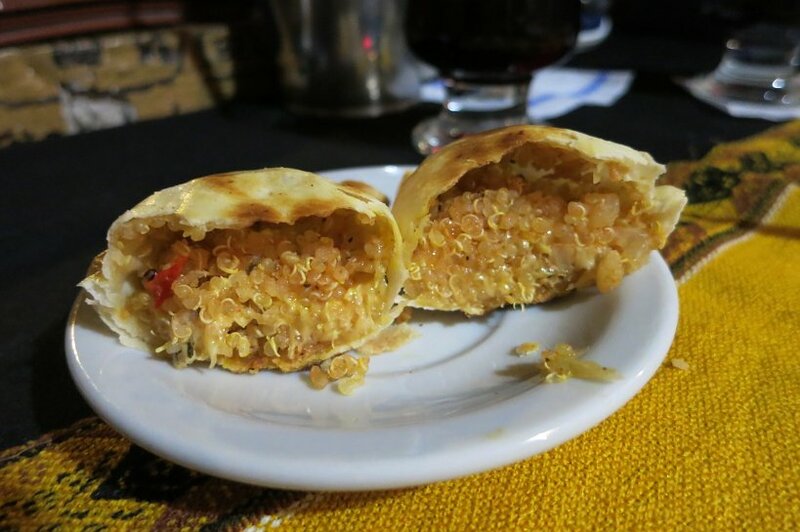 After having experienced empanadas in both Salta and Tucuman, we prefer the Salteñas. We like their small and dense size. The potatoes in the empanadas are delicious and the spicy sauce adds a nice bite. In our quest to understand authentic food from Argentina, we wrote about meeting with Francis Mallmann, Argentina’s top chef. In our discussion we discovered that there is in fact a technique to eating authentic empanadas. So, if you would like to eat empanadas like an Argentine, apply these 3 tips shared by Francis Mallmann. First you don’t want to use for and knife. It is a “sacrilege”. An empanada is to be eaten with your hands to appreciate it to its best. Second, when you bite your empanada, you don’t want to let anything fall on your plate. 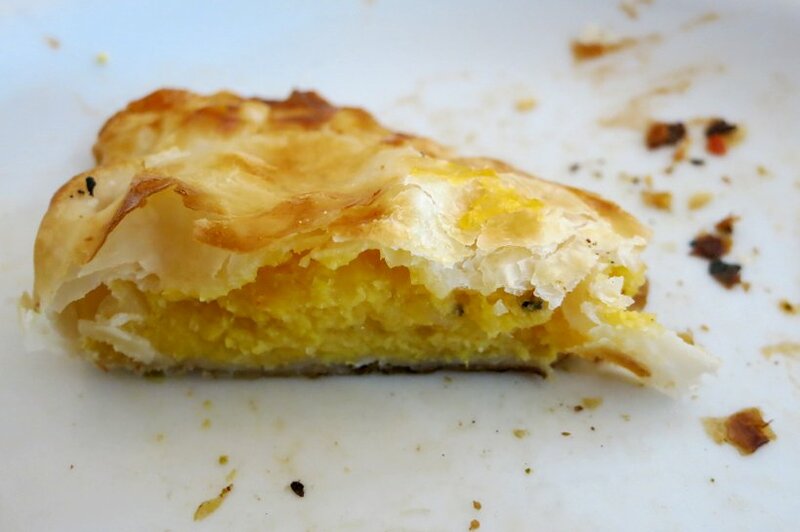 You want to show that you really enjoy the empanada which means nothing is to be omitted. However, that presents a dilemma. 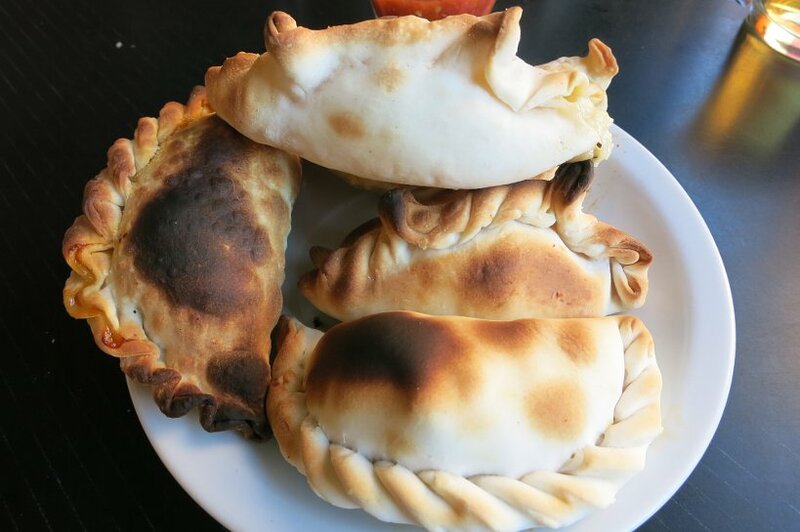 The empanadas come from the horno (clay oven) hot and you are almost sure to burn yourself. It takes skill, delicacy and patience to apply this particular tip. 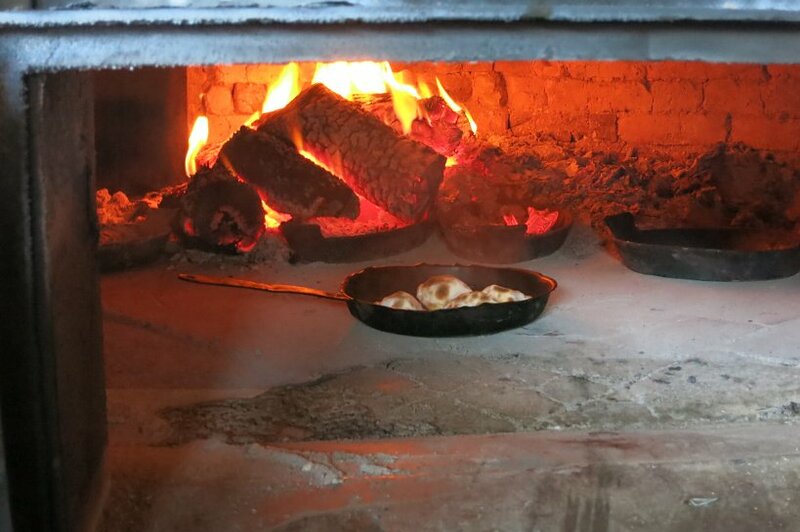 Third, you want to get your empanada cooked in the horno de barro (clay oven). These are said to be the best. To make sure that the empanadas were cooked in an horno de barro, you will notice that the dough of the empanada “bubbles” up at the surface. This is a signature of a “real” empanada. One of our best experiences on our quest was the opportunity to make authentic empanadas. Ok, we didn’t make everything from scratch but we had the chance to cook them with chef Matias from Siete Fuegos, Francis Mallmann’s restaurant in Mendoza. 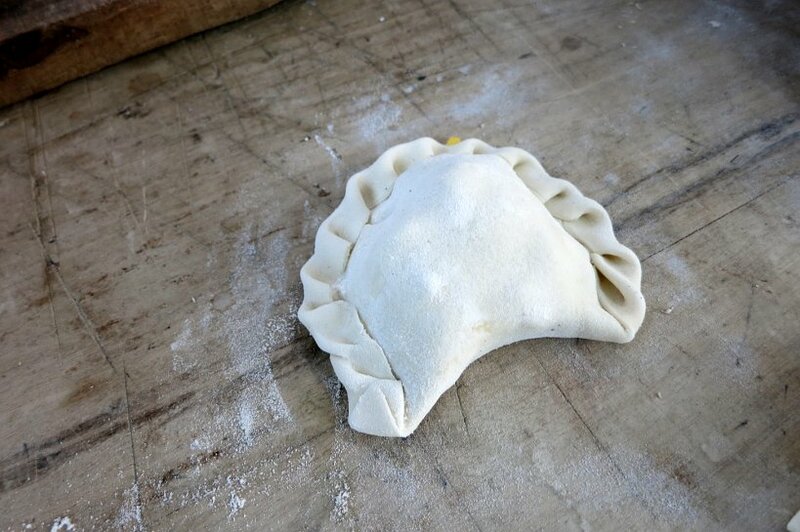 In the short video that you can see here, chef Matias explains how to make Mendocini empanadas. Empanadas are a national symbol and the preparation in each province is taken very seriously. Even though empanadas are widely available, it’s important to appreciate their roots and the cooking techniques as much as the flavors. We have enjoyed getting to know Argentina through its authentic empanadas and appreciate the national heritage and pride of these delectable treats. 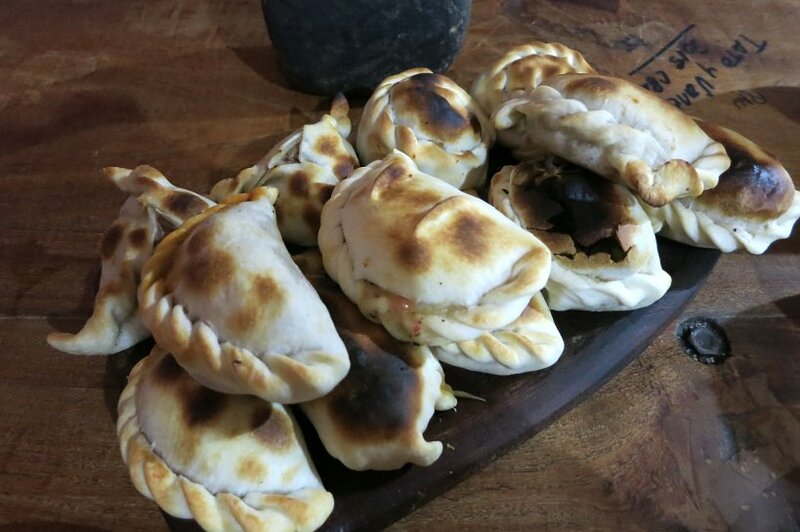 Although we are about to leave Argentina to Uruguay for a few weeks, we are already thinking about tasting new empanadas when we come back to Patagonia and discover the lamb empanada specialties. So stay tuned for more on the empanada journey from the South of Argentina. Beautifully done! I was living in Argentina for the last couple years and then set out with my Argentine hubby in May for some world traveling. I came across this article and basically relived all of my experiences eating empanadas in Argentina, almost made me cry! haha. But not because of your article, because of how much I miss and love that country. We’ll go back soon though. Really enjoyed this article and just wanted to let you know. Cheers! Thanks Stefanie! Glad you like the empanada quest 🙂 We are having a great time discovering Argentina through its foods specialties. And there is so much to discover! Is there anything else you recommend or would like to read about? Saludos! I love empanadas. Great idea to seek out the different types via different cities. Nothing better than great flavor packed in one bite . Thanks Keri! It’s been a great adventure to discover food all over Argentina. 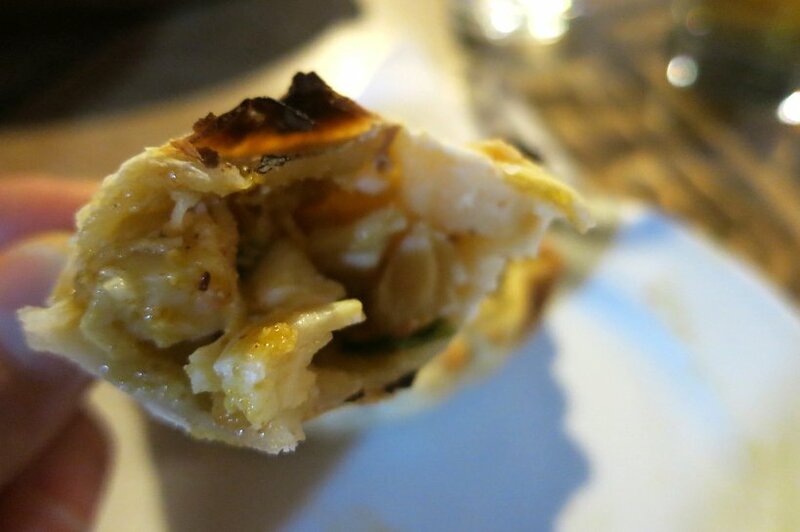 Empanadas are definitively a must do and surprisingly different from one province to another. Enjoy the quest! Never been to Argentina but I do like empanadas. Anytime you wrap dough around meat and cook it it has to be good. The carne picante pictured looks really good. You are so right…meat wrapped in dough is delicious and the empanadas from Argentina are some of the best we’ve ever had. The carne picante is exceptional:) Cheers! Thanks Fiona. Glad you learned something new about the different folds and their significance. What’s your favorite empanada? Do they have exotic ones like quinoa or llama in London? Those empanadas looks so amazing. I’ve had some local Filipino empanadas from the northern provinces here and they’re definitely different than South American empanadas. I could really go for some of that right now though! wow, it’s almost lunch time here in Italy and I’m hungry after reading this post 🙂 I’ll try to make the ones with quinoa waiting to go to Argentina and try!! Thanks Sabrina and glad the post got you hungry. You will have a great time in Argentina. We’ll be curious to know what you think of the quinoa ones. Cheers! Wow! I really love empanadas. Although I must say, the empanadas from La Tacitas look a bit too burnt for me. Thanks Karla for your comments. Actually the empanadas from La Tacitas are not burnt, they are just crispy from the oven. They are absolutely delicious. If you get to Salta, Argentina, do give them a try. Cheers! You are so right Anne. Empanadas never fail. They are so easy to eat as a snack or a meal. A nice treat to have around. Cheers! I’ve never tried empanadas, to be honest (well, I also haven’t been to Argentina yet). After reading your post, I have to say – they look delicious!! And there are so many different kinds you can try. Definitely will eat all of them if I travel to Argentina. Hi Kathrin, glad you enjoyed reading the post and discovering all the different types of empanadas you can have in Argentina. One thing you can always do prior to a visit to Argentina is to try out a local Argentinean restaurant in your area. You will not only enjoy the empanadas, but get a slice of the culture as well. Best! Thanks for the detailed descriptions and then tips for how to eat like a local! I haven’t yet made it to Argentina and haven’t before tasted an Empanada but it’s on my list now. Very cool that it’s essentially a national specialty but regional in what goes inside it. Llama meat would have been interesting to try for sure. Thanks for the tip on not using a knife – and I’ll be mindful when we get there not to let any drop on my plate …. don’t want to offend anyone! Glad you enjoyed learning more about the empanadas in Argentina. 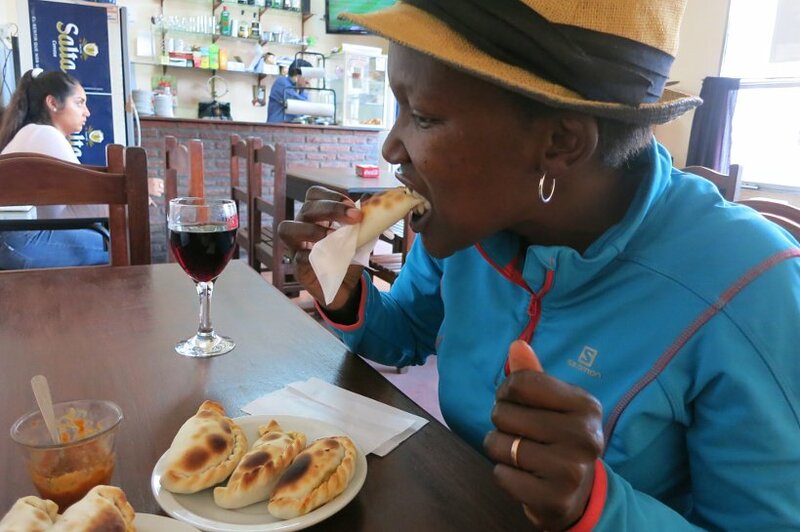 Think of this as your advance tips on how to eat empanadas in Argentina. True, the llama meat was one of the most fascinating…followed by quinoa! Hope you get to Argentina soon and try them out for yourself! Cheers! Tasting empanadas is a tough job, but someone has to do it, right?! I love getting to know a country’s food staple! And I also especially love how cooking style and ingredients vary from region to region! I ate way too much empanadas with all the time I spent in Argentina and enjoyed EVERY SINGLE BIT OF IT. I discovered my love for cooking whilst being on the road and I’m quite excited to try making empanadas myself now that I have temporarily back home in the Philippines. We also have our own version of empanadas here! That’s great Trisha. Truly the empanadas in Argentina are outstanding. How do the empanadas in the Philippines compare with the ones in Argentina?